RTR WTC + Propellers For 1/72 Revell IXc U-Boat Use (Not Included Model kit). Not Included Model Kit (RTR WTC + Propellers Only). 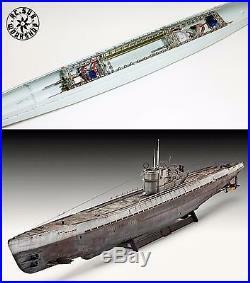 1/72 REVELL German Type IXc U-Boat (WTC BOX) (x1pc). 2mm Waterproof Silica Gel Layer (x1pc). WTC Electric Wire Duct (x1pc). Gearbox 130-180 Size Motor Gear box (x2pcs). Motor MINI-ESC (FORWARD & REVERSE) (x1pc). High Speed JAPAN Electric Motor 180 (x2pcs). Motor shaft seal set - ID"3"mm Type "SS" (x2pcs). Uj 2mm x 2mm (x2pcs). Rolling Pump Type-B -D (x1pc). MINI-ESC Type M (For Water Pump) (x1pc). One Tube Ballast Tank Liner 220mmx110mm (x1pc). Rubber Bellow + Copper Tube (x3pcs). The item "RTR WTC+Propellers For 1/72 Revell IXc U-Boat Use (Not Included Model kit)" is in sale since Friday, November 24, 2017. This item is in the category "Toys & Hobbies\Radio Control & Control Line\RC Model Vehicles & Kits\Boats & Watercraft". The seller is "rc-sub-workshop" and is located in Shatin. This item can be shipped worldwide.